Full four cycles of the seasons hath now passed since I sat down at this keyboard, or one very much like it, to type in the first little anecdote that would launch my career as a blogger. It is coincidentally two years since I released my cover of Dr. Hook's "Sharing the Night Together" on you. Also, the 517th Anniversary of the Treaty of Tordesillas. 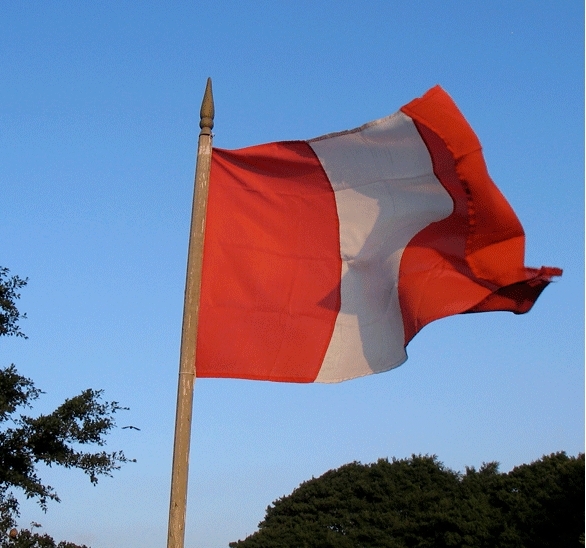 And, we shouldn't forget, it's Flag Day in Peru! But I digress. To commemorate four years of entertainment and edification, I took a little stroll through the archives to put together a brief history of this here web-based enterprise. And voila! Won't you join me in reminiscing about when your favorite features, and least favorite features, first appeared? About how the Life & Times has gradually evolved over the years, never sacrificing its trademark glib humor and sly intelligence? No? You won't? OK.
June 7: The first post. July 17: The “Introduction to Boring Postcards” post; Boring Postcards will appear only sporadically for the next couple of years. August 1: I begin compiling The Reading List. August 30: The first Thursday Quiz appears. September 3: The finalized Reading List is announced. September 24: I write the First “Great Movies” Review. October 1: The First Monday Quiz appears. October 18: The first Dorkfest gets underway; Dorkfest will become a yearly event. November 11: "Intermediate Scrabble Strategy" appears; it remains the most-referenced post on the blog. January 22: After 4½ months, I finally write up “The Brothers Karamazov.” After that, Reading List reviews occur roughly monthly. March - July: “The Forgotten Lands” have their first go-around. May: The First L&TM5K Decathlon occurs. May – July: “Classical Wednesdays” run. December: By the end of the year, we’re up to Monday Quiz LVI and Thursday Quiz LXVI. January 9: The first entry in the “Coffee Table Book Party” series appears. It’s supposed to be a monthly, but it will often be neglected. I'm working on that. February – December: “The Michael5000 Kitchen” has a 14-post run. May: The second and final LTM5K Decathlon occurs. September 9: The first “Song of the American Road” appears; it will become a monthly feature. September 23: The Thursday Quiz ends its two-year, 100-post run. September 28: I end the Monday Quiz after 90 posts, and announce the end of daily publication. However, daily publication fails to end. October 2009 – May 2010: “The Library Sale CD Trove:” A long series of reviews of a random set of CDs I picked up cheap. I don’t know why I did this. November 6: The first Element of the Month, Ruthenium, is introduced. December 2: The Wednesday Quiz begins publication. January 15: The first “Flag Friday” appears. July 2010 – January 2011: “The Forgotten Lands” have their second go-around. August 25: After a year and 48 posts, I announce the end of the Wednesday Quiz and imply the end of daily publication. However, daily publication fails to end. The Thursday Boring Postcard becomes the Wednesday Boring Postcard. August 28: “The Bear Chronicles” makes its first appearance. November: I finish up the “More Movies,” expect for “Avatar,” which has to wait until February. January 5: A new version of the Wednesday Quiz begins a 26-letter run. The weekday Boring Postcard shuffles back to Thursday. March: March Madness comes to town for a tournament of the U.S. state flags. April 1: The L&TM5K finally caves to the temptation to make an April Fool’s joke. June, 2011: The second version of The Wednesday Quiz runs out of letters. July, 2011: The third version of The Wednesday Quiz starts. August, 2011: Having depleted the record of former adventures, “The Bear Chronicles” moves to bimonthly publication. September, 2011: Approximate end date of "Flag Friday" series. October, 2011: Due to budget cutbacks, you start getting only one Boring Postcard per week. November, 2011: I finally launch "Michael5000 vs. Mahler," a sure-fire reader magnet. March, 2012: Another wacky March Madness tournament happens. November, 2016 - February 2018: A period of long, meandering religious posts corresponds with a difficult time in my personal life. Late October 2017 is marked by a ten-day run of hourly installments of "The Postage," all featuring stamps on religious themes with extensive exegetical commentary. February, 2032: Daily publication ends. You will probably hate to hear this, but I check your blog daily (though don't comment all the time) and was actually unaware there was such a rigorous schedule. I hope to hang with you until 2032 ... assuming my own blogging career lasts that long. I need the flags and boring postcards and impossible quizzes to continue. It just won't be the same without you. Keep it going, son. I look forward to your great religious crisis, or at least to its disappearance in Feb. 2018. Thanks for the heads-up. Happy anniversary, and many happy returns! You sure do have a lot of content! I think my favorite series has been the Elements of the Month, so I'm glad that it's going to last for a long time, but if I thought about it more, I might pick The Library Sale CD Trove (Veracini all the way, baby!) or The Michael5000 Kitchen, which were also highlights for me. Admitting this makes me feel goofy, but at least we're all dorks together here. I also think your one-offs are worthy of mention--they include some very memorable posts! I just want you to know, Jeopardy had a State Flags and Seals series and --thanks to YOU-- I was a killer! I nailed 'em! Woo hoo! Great blog. You know how I feel about Flag Fridays, but I my favorite all-time post is still that great anecdote about the video store and that student who flunked your class. Eric refers to this anecdote. I think you should ritually republish it every 18 months just to keep us all going. Forgotten lands is still my favourite, but I also loved the Thursday quiz and your general wit and charm. Also, I dislike the boring postcards. They're boring.